Lush greenery and a gentle stream winding through a narrow canyon make this the perfect day hike. My favorite hike from last spring and summer was Box Death Hollow, which is a narrow canyon located about 20 miles north of Escalante, Utah. The trail is about eight miles long from trailhead to trail end. It features scenic, diverse terrain, cool temperatures, and regular glimpses of wildlife. It’s rugged without being overly demanding. Another great thing about it is that it’s downhill all the way. In preparing for our hike we shuttled one of our vehicles to the parking lot where the trail ends then drove back to the top of the trailhead. 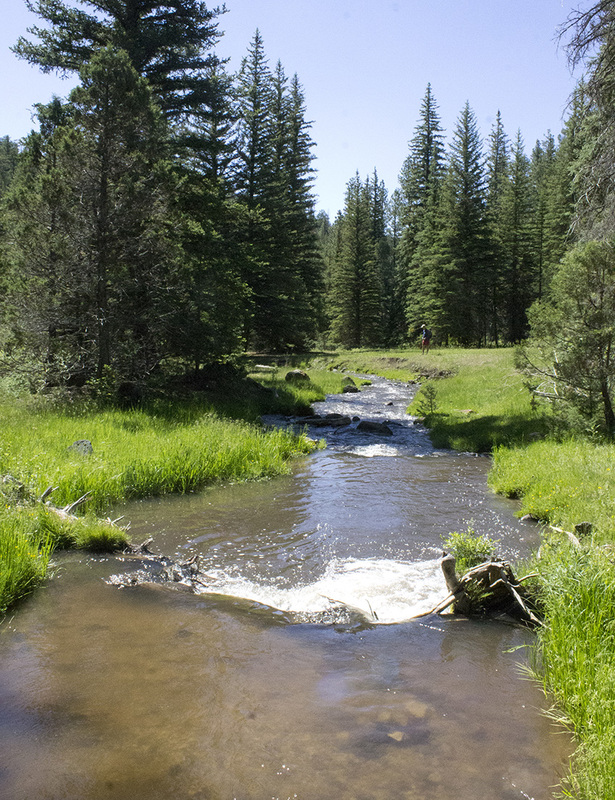 The trailhead starts in a beautiful alpine meadow filled with a cool, burbling trout stream, blue spruce and aspen trees. After hiking beside the creek for about half a mile we enter a narrow, steep walled canyon. The trail will remain inside the confines of the canyon for the duration of our hike. The trail follows alongside Pine Creek and frequently crosses it. As the trail drops in elevation the vegetation changes to manzanita bushes, juniper trees and ponderosa pines that are two hugs in diameter and more than a hundred feet tall. Pine Creek, the stream that carved Box Death Hollow out of the Navajo Sandstone, runs year-round. Because of its presence wildflowers – in yellow, white, purple and red – by the thousands adorn the trailside and several varieties of butterflies were attracted to the coolness it created. 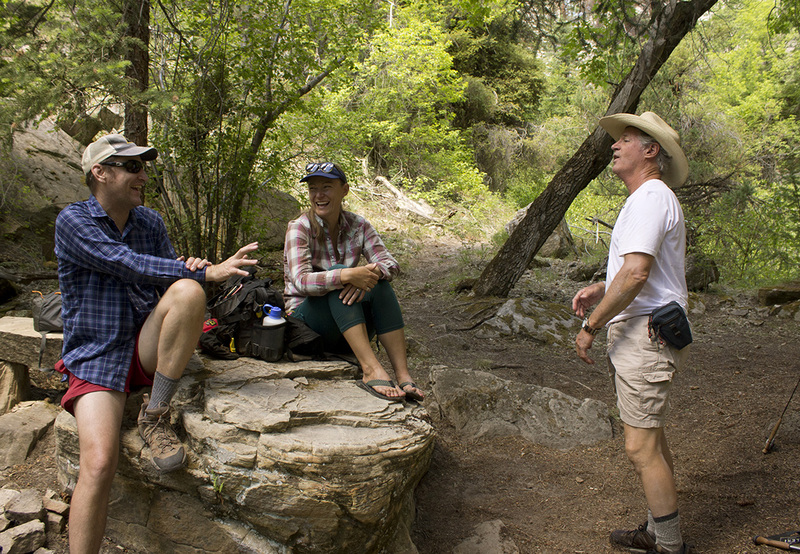 I was hiking with my friends Clint Anderson, Alissa Jones and George Hardeen. Alissa, George and myself had traveled there from Page, Ariz. where the daytime highs were around 105 degrees. But in the higher elevations of mountains the day time highs were in the low 80s and the relative coolness felt great to us. His comment starts the rest of us listing our favorite parts about the hike. “I like all the trees,” one of us said. All the butterflies, all flowers, all the cool mountain air, were our other favorite parts about it. The hike is moderately difficult. You will cross the stream more than 50 times during your hike. Logs and creek rocks can be slippery. I recommend bringing a hiking stick to help you keep your balance. Mosquitoes and deer flies can be prevalent in the spring and early summer. Long sleeve shirts and insect repellent is recommended. It took us a little more than six hours to go the eight miles, but that also included several rest breaks. From Escalante, turn north on Hells Backbone Road. At 0.7 mile the road will fork. Stay right. After 3.5 miles the road will turn to dirt and becomes Forest Road 153. At 7.4 miles you’ll pass the Lower Box Access. If you have two vehicles this is where you want to leave one of the vehicles to get into after your hike. To continue to the upper trailhead stay on Forest Road 153. At 13.6miles the road will fork. Stay right following the sign to “Hells Backbone Bridge.” At 17.9 miles you’ll see a sign that says “Upper Box Access.” Park on the narrow shoulder near the sign. Follow the creek and it will lead you into the canyon. If you only have one vehicle a few operators in Escalante can do a shuttle for you. A dayhike into the Gand Canyon.